At my interview for war service I was offered two situations. One was to become a servant for Colonel Blackie in Rhu. I was having none of that — no skivvying for me! The alternative was to be a bus conductress, but I did not fancy that either. At home when the interview was discussed my Dad pointed out that I had a trade, as I was an apprentice seamstress employed at Kerr’s the Upholsters in the town. Yet another interview when I stated my case. The interviewer agreed that it was a better option, but I would have to travel to Glasgow for war work in that field. It was agreed that I would work for the London Midland Scottish Railway Company. This meant travelling to Glasgow on the 6am train and returning home at 6pm. I did not mind the journey and I enjoyed the routine, my work and the company. On fine days I went to the Necropolis Cemetery to have my lunch. I enjoyed the solitude. It was such a peaceful place, and I walked around reading the old headstones. The different views of the Clyde and the overview of the city were spectacular. Tom Mackinnon, my brother’s mate, came from Inverness. He had a long time to wait for his train connection so my brother brought him home to meet my folks. After that we wrote to each other until D-Day, but then there was a long silence. Everything changed after November 1 1944. 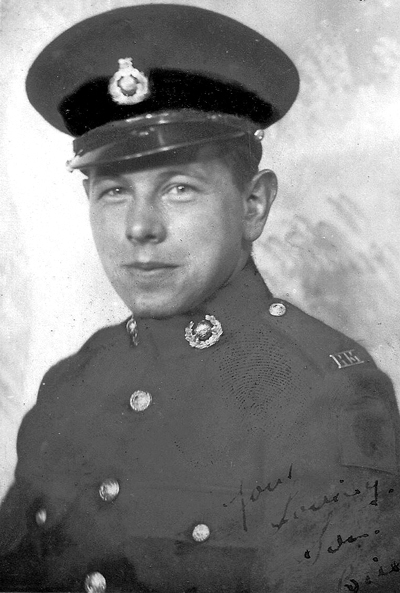 William Stewart McPhail, my brother, the Marine Commando, lost his life at the age of 20 when his ship was bombed. Tom, whom she was later to marry on March 6 1946, was badly injured. It transpired that, after being involved in the D-Day landings, they had sailed to Walcheren Island where their landing craft LCH37 was blown up by German guns and sank in 9 minutes at 9.10 am. The weather had become so bad that air cover had been withdrawn. I had to stay at home after my brother was killed. I got transferred to my old job because the firm was now doing war work. They were responsible for the interior upholstery of MTBs, the motor torpedo boats. We also worked at private houses laying and repairing carpets, for example. It was necessary to have a pass to travel to the peninsula. Going to a job in Garelochhead I did not have one — and the result was that I had to make the journey hidden in a carpet in the back of the van! I was scared stiff that we would be stopped en route. However, all went well and the customer was satisfied. Pearl Harbour happened in 1941 and life was never the same. Rosneath had become the site of a huge American enterprise as part of a defence base which had been under construction for some time under civilian management and headed by two civilian engineers. The day Pearl Harbour was attacked they appeared in uniform! One mid-afternoon I stood with my Mother outside Woolworth’s shop (now Wilkies) on the front opposite the car park and watched the first American soldiers to the town march six-abreast into the car park. I was struck by the fact that each carried a neatly folded raincoat over an arm. Life on the peninsula would never be the same again. The Americans settled in quickly. The camp was a building site but the majority were in transit as they were sent here to be deployed elsewhere. Entertainment of all kinds was provided to keep them occupied and help keep up the morale of idle young men far from home. Invitations to dances at the Base were extended to Helensburgh. Committees and two local ladies arranged the allocation of tickets to people they could vouch for. The tickets were greatly prized, and the dancers were transported by Liberty Boats to Rosneath. I enjoyed many happy occasions at those affairs with great music, and I learned to jive! The food was lavish and beautifully presented. Fruit, tinned fruit, cakes of all kinds baked with white flour, flour unattainable to us but not to the Americans. One of the ‘perks’ was the gift of a very large, long pan-loaf and a tin of butter, both real treats. The lads were mostly young, well-mannered, generous soldiers. Any nonsense and they would be charged and barred from the dances. One member of the group we knew gave me ten dollars ‘to go to the pictures in America when the war was over’. I remembered them many years later, and gave them to my grandson who was going to America. The locals too arranged treats for the visitors and much entertainment for them all. For real dancing we went to Luss -— on foot eight miles there and back. My Dad had my breakfast sandwiches packed ready for me to eat on the train. The Barn Dances were held at Steven’s Farm at the top of the hill in the town, beside the camp where the ack-ack guns were situated. Other dance venues were the Victoria Hall, Holyrood Ballroom and church halls. My Dad was a member of the Special Police and had to go on duty during an air-raid. My Mother and I did not go to the air-raid shelters at 35 Colquhoun Street — we stayed indoors and watched the bombs fall near Clyde Street School and up on the moor. Our war was obviously not all dancing and visits to the picture houses, which showed four films a week and was popular with all age groups. But it was for a little while, a release from the tensions created by war which affected people all over town. As the death toll in all services rose and the worry about the state of prisoners of war in Europe and Japan increased, every little break was welcomed.